SCALA is a digital signage company, originally founded in Norway in 1987. They create tools for managing and delivering visual content across a network of signs, kiosks and internet connected devices. Their software supports over 500,000 screens in over 100 countries around the world. 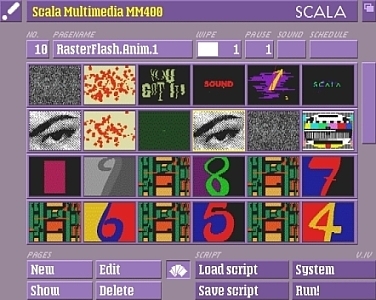 SCALA was originally developed as a multimedia package for the Amiga range of computers. Their first customers were hotels and cable companies who used the software to provide video titling, slide shows, informations screens, animated captions and infographics on connected tv screens. The software was bundled with a selection of typefaces, transition effects and custom backgrounds. I first encountered SCALA in the 90s, when it was a cover disc on one of the Amiga magazines. The software, designed for the 500+ model was fascinating, easy to use and incredibly powerful. It was my first introduction to what is now called Digital Signage. At the time, SCALA software combined with the Commodore Amiga’s powerful video and audio capabilities was fairly potent and could be used to create quite sophisticated video displays for use in shops, libraries, schools or other public spaces. When Commodore, the parent company of Amiga, collapsed in the 90s, SCALA redeveloped the software for MSDOS on Windows. I cut my multimedia authoring teeth on MM100 and its increasingly powerful upgrades, including InfoChannel. The software was pretty revolutionary for its time. Like SCALA, I’m still in the business of creating digital signage, video animations and motion graphics some twenty odd years after I first discovered the software. The tools I use today are not vastly different. But I still get a kick out of pulling together animations, transitions, wipes and other special effects to create stylish visuals for use on plasma screens and e-billboards. I’d love to bring my know-how and creativity to your next digital signage project. Contact me if you’d like to discuss working together. Posted by Tim Longhurst on Tue 13 Jun 2017.